Ad.doubleclick.net is the PUP that uses misleading techniques to prevent removal. Use Reimage to locate malicious components and get rid of them faster than with uninstall instructions. A full system scan blocks virus reappearance and prevents traffic to malicious domains. 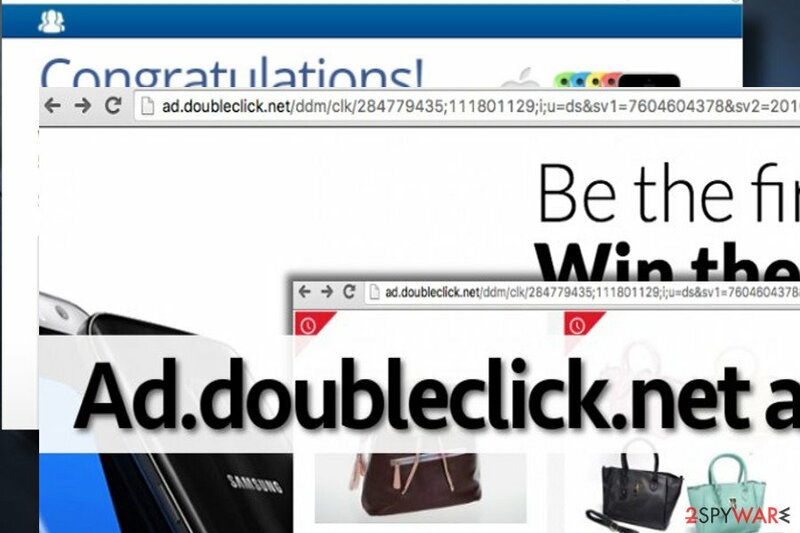 Doubleclick.net is a potentially dangerous marketing service which is closely related to adware. This service is used for advertising and is known for redirecting people to doubtful third-party domains against their will. Some of Ad.doubleclick.net ads may feature professional design and appealing content, but, once clicked, they redirect their victims to irrelevant sites promoting third-party software, software updates, useless products, and so on. According to malware researchers from dieviren.de, this malware is capable of affecting all operating systems and can easily hijack all most popular web browsers (Chrome, Firefox, Internet Explorer, Edge, Safari, etc.). As a result, you may start receiving intrusive ads due to Doubleclick.net virus infection. We use the term “virus” because many computer users tend to call this program like that. In reality, it is just a low-level computer threat which is more annoying than dangerous. In this article, we will try to explain how this potentially unwanted program behaves, what are it’s goals, and how to remove Doubleclick.net from the system. Besides, we will clarify how did it manage to get inside your PC without being noticed. First of all, this PUP is misleading in terms of distribution and behavior. Once it is installed on a target system, it adds a browser extension to every single web browser that it finds on it. Soon after that, Ad.doubleclick.net ads will deluge each website that you are going to visit. Apart from being annoying, those ads are potentially dangerous. Most of them generate pay-per-click revenue to their developers. The others help third-parties to increase traffic to unpopular or newly developed websites. However, there’s always a risk of clicking on malicious pop-up designed by hackers which may redirect to phishing websites or trick you into installing fake software updates that hide malware. Bear in mind that, no matter what content Ad.doubleclick.net virus presents, the purpose of this advertising platform is to redirect you to one of its sponsors’ sites. You can never know if they are worth your trust or not. Most likely these ads will lead you to various third-party websites. If you are not sure whether the web page is safe or not, just stay away from suspicious download links, and do not provide your credit card information. 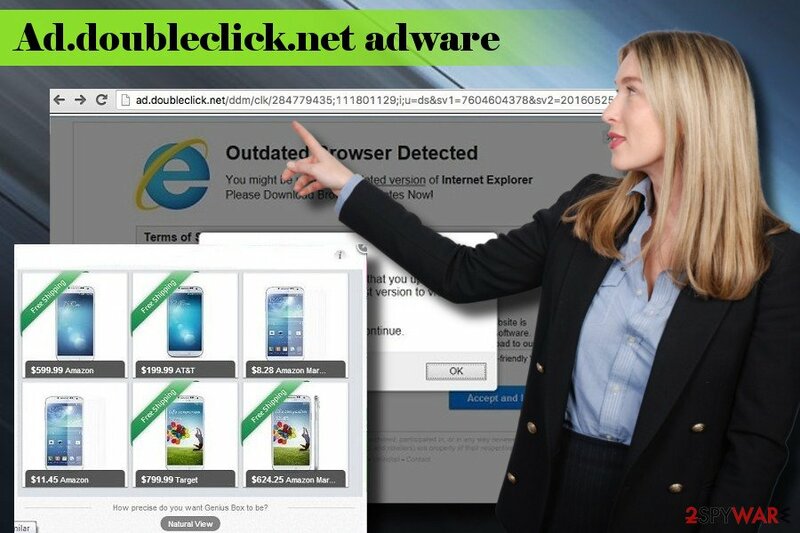 It is better to be safe than sorry, so we recommend you to remove Ad.doubleclick.net adware from your computer to stop these misleading ads from bothering you. The easiest way to initiate complete removal of adware-type program is to use a reliable anti-spyware program, for instance, Reimage. Nonetheless, those who prefer removing PUPs in a regular way can find a detailed Ad.doubleclick.net removal guide for Windows 10 and other operating systems at the end of this post. Inadequate amount of pop-up, banner, interstitial and other type of ads during browsing session is a sign of adware infection. If your web browser keeps redirecting you to specific domain or new tab window, it means an adware infection either. Computer security experts claim that such programs are potentially unwanted ones (PUP) and that they usually spread along with other free programs. PUPs are often added to freewares and presented as “recommended downloads.” The best way to maintain your browsing session’s experience as it is now, refuse to install each extension, add-on or toolbar despite the fact how vividly it may be introduced. To avoid installing them, we suggest you always to opt for Custom or Advanced installation mode when you open a setup wizard. These modes allow seeing what extra applications are added to a free program. All you have to do to remove them is to remove the tick from checkboxes next to pre-checked installers. In fact, calling this program as Doubleclick virus is not a good idea, because it is not malicious and it does not act like a virus. Nevertheless, based on its behavior and infiltration technique, it’s a standard adware and potentially unwanted program. Here, look for Ad.doubleclick.net or any other recently installed suspicious programs. Wait until you see Applications folder and look for Ad.doubleclick.net or any other suspicious programs on it. Now right click on every of such entries and select Move to Trash. As soon as you eliminate the adware, don’t forget to reset Internet Explorer. When in the new window, check Delete personal settings and select Reset again to complete Ad.doubleclick.net removal. Once these steps are finished, Ad.doubleclick.net should be removed from your Microsoft Edge browser. Here, select Ad.doubleclick.net and other questionable plugins. Click Remove to delete these entries. Now you will see Reset Firefox to its default state message with Reset Firefox button. Click this button for several times and complete Ad.doubleclick.net removal. Here, select Ad.doubleclick.net and other malicious plugins and select trash icon to delete these entries. Click Reset to confirm this action and complete Ad.doubleclick.net removal. Here, select Extensions and look for Ad.doubleclick.net or other suspicious entries. Click on the Uninstall button to get rid each of them. Now you will see a detailed dialog window filled with reset options. All of those options are usually checked, but you can specify which of them you want to reset. Click the Reset button to complete Ad.doubleclick.net removal process. ^ Lee Brandt. The Dangers Of Adware And Spyware. Poindexter. On-site tech support, computer repair, and web development services. ^ DieViren. DieViren. Spyware and Virus news. ^ PPC Advertising: Growing Your Business with PPC. WordStream. a Premier Google Partner. You can quickly scan the QR code with your mobile device and have Ad.doubleclick.net ads manual removal instructions right in your pocket. How did you remove Ad.doubleclick.net ads?